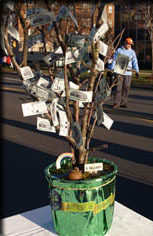 The 2006 State Employees Federated Appeal (SEFA) at SUNY-ESF culminated with the ‘Delivering of the Green’ to United Way Headquarters in Syracuse on November 21, 2006. ESF President Neil Murphy and SEFA/United Way Chair Mark Hill delivered a money tree sprouting ‘Murphy Bucks’ created just for the occasion. They made the delivery in one of the college’s electric powered vehicles. 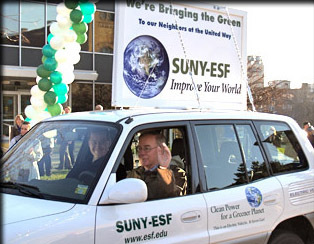 Over $57,000 was donated or pledged by SUNY-ESF staff and faculty.